And so with mediation, the profession/activity/vocation that has grown on me like a skin these last nineteen years. Each time I practise I marvel at the almost infinite nuances and layers of a three-way encounter. And yet what could be simpler than someone sitting down to help two others sort out a disagreement? I also have a lot of sympathy for learners. It doesn’t help much when ‘experts’ say “This is really complicated”. We need to start somewhere. We can’t take in every idea, nor can we acquire every skill, in one big dollop. We need simple skills which we can learn and repeat, and we need a clear framework. A good, simple framework allows us to gradually pick up all the complex, clever, difficult ideas and slot them in without confusion. ‘The Three Pillars of Mediation’ is my offering. The idea has been brewing for the last five years, since I took a Masters course in Mediation at Birkbeck College, University of London (and a special thanks to the course leader, Lorraine Schaffer). The MSc was a marvellous induction into complexity, scanning the (anglo-American) literature on mediation, psychology, philosophy, therapy, justice and lots more. We were made to think hard about our practice, to write, discuss and chew over the novelty and oddity of this work. I have little doubt that it made us better practitioners. And yet, when I looked back on two years of study, it seemed to me that it could all be summarised under three headings. These are the ‘Three Pillars’. I offer them in a spirit of enquiry: if they can be pulled apart and improved, so much the better. The idea is to start simple and allow for complexity. To mix my metaphors, each one acts like a trunk, from which numerous branches can grow. So what are they? Well, Conflict, Communication, and Resolution. To give them their full titles, they are Conflict (Theory), Communication (Practices) and (Paths to) Resolution. They can be used to teach anyone about mediation, from schoolchildren to judges. How do they work? Under Conflict Theory we have the body of knowledge that underpins mediation. As a foundation we need to understand the physiological impact of conflict: the physical responses triggered by anger or fear and their effect on our thinking. Then there is the vast body of psychological insights, such as Morton Deutsch’s work on cooperation and competition or Kahneman and Tversky’s work on cognitive biases. This pillar also includes ideas of justice. Because the law casts such a strong shadow over mediation we sometimes overlook its own theory of conflict, or what lawyers call ‘disputing’, manifested in, for example, the adversarial system. Then there are personality based approaches to conflict, such as Thomas Kilman or Kraybill Conflict Styles Inventories. Given more time we can consider emotional, cognitive and behavoural responses to conflict, or turn to the burgeoning body of neuroscience research. Each pillar can provide an hour, a day or a semester’s worth of teaching. And finally there are Paths to Resolution. This allows us to look at the popular models of mediation. I liken these to maps or guides, leading us step-by-step from conflict to resolution. The simplest, most taken-for-granted path was elegantly laid out in the 1980’s by Quakers Jennifer Beer and Eileen Steef in their ‘Mediator’s Handbook.’ Most mediation training in the Western world borrows at least some of its ideas from this often unacknowledged classic. The ‘mainstream’ mediation model has gone on to predominate, and authors too numerous to mention have contributed to the canon. But turning to complexity again, I strongly argue that new mediators ought to know about other models, not least because it gives them options, something we are always keen to offer our clients. Bush and Folger’s Transformative Mediation and Winslade and Monk’s Narrative Mediation are perhaps the best known and deserve serious study. There are others: Kressel’s ‘Strategic Style’ is one innovative framework, and another neglected gem is Daniel Dana’s ‘Managing Differences’ model of workplace mediation. And of course it would be neglectful not to include Fisher, Ury and Patton’s ‘Getting to Yes’, a negotiation model that has influenced generations of mediators. Doubtless each pillar could be populated by many more sources. I make no claim to a comprehensive knowledge of mediation literature or practice. But I have used the three pillars with students and learners for the last four years and they seem to provide a foundation on which to build mediation learning. At the end of a course they draw together the theoretical and the practical, while allowing space for mediation’s own body of knowledge. Some outstanding questions remain for me. Where should I slot in ethics? Or the impact of culture, gender or power? Or reflective practice? Maybe these are overarching issues that should inform all three pillars. I am happy to have these pillars supplemented with new ideas. And yet, somehow, four pillars just wouldn’t cut it. To return to simplicity, I recall a nice moment during a course delivered by US mediator Kenneth Cloke. He paused while explaining a fascinating but complex model of conflict, and confessed: ‘I make this stuff up.’ And so do we all, Ken. I have no desire make mediation any more tricky than it needs to be. 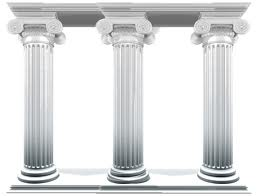 I hope the three pillars can bring some useful simplicity to the work. LOL. I’ve actually had a similar experience with a live client. We were half an hour into a slightly weird conversation before he said ‘That was really interesting but I wouldn’t call it meditation’. Maybe they’re not so far apart.